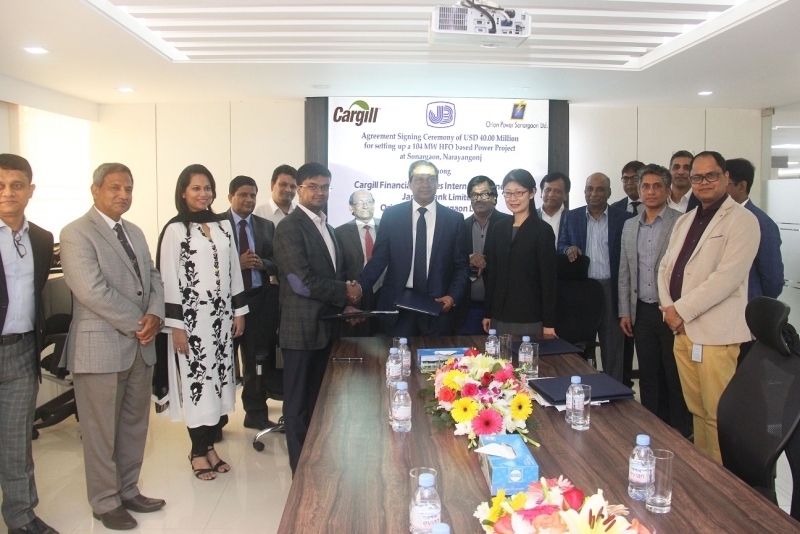 An agreement was signed among Orion Power Sonargaon and Cargill Financial Services International Inc. USA and Janata Bank Limited. on a financial loan to cover Orion Power Sonargaon Ltd, a 104 MW HFO based power project being implemented at Meghnaghat, Narayanganj. The event took place in the Corporate Office of Orion at Orion House, Dhaka, Bangladesh on March 12, 2019. Ms. Oh Hwee Chin, Regional Manager, Transaction Management (Trade & capital Markets) of Cargill Singapore, Mr. Enam Hoque, the General Manager of Janata Bank and Mr. Salman Obaidul Karim, the Managing Director of Orion signed the agreements respectively. Mr. Mohammad Obaidul Karim, the Hon’ble Chairman of ORION along with high Officials of ORION, Mr. Rajneesh Garga of Cargill Financial Services International Inc., Mr. Md. Enamul Hoque, General Manager, Mr. Md. Mustafizur Rahman, Deputy General Manager, Mr. Abul Bashar Md. Abdul Hannan, Deputy General Manager of Janata Bank Limited were present during the occasion. Through this Agreement, Cargill Financial Services International Inc is providing a substantial loan to OPSL through Janata Bank.